Our house, circa 1978 was wallpapered in virtually every room. The sad thing was my parents didn't think to prime or paint the walls pre-wallpaper so the paper is nice and stuck to the drywall. So we are removing two layers of wallpaper from drywall and it. is. not. easy.!!!!! (Don't believe HGTV and all the home makeover shows, it's not as easy as it looks!) Every 15 minutes I ask mom..."so, you and dad didn't ever consider painting these walls?" and her response is..."in 1978 this house was pretty!" I feel sorry for mom because this is one of only two weeks a year she has without kids (she has a home daycare). She's spending her only vacation working...that's not good! She is 62 years old and works 50 weeks a year, 10 1/2 hours a day, 5 days a week and has only missed one day in 15 years for illness. The woman is amazing, but she needs a break. If I had money I would take her on a nice luxury vacation (she hasn't been on a vacation in a really long time!) But, I'm broke and so is she so we are here destroying our house! Taking the wallpaper down was two days worth of work. It came off in tiny pieces until we rented a steamer and it helped a lot. Then the sanding and patching and sanding again took a day. That is what made the house so dirty. The dust was everywhere even though we tried to cover up the doorways. My arms, shoulders, and hands are so sore! I did all of the sanding and it was quite a workout. Mom went behind me cleaning up the dust and washing the walls down. Now, we are ready to prime and then paint. With the condition of our walls, it will take several more days to complete this project because the primer will have to dry completely and I'll probably have to go back and patch the places I missed. Have I mentioned today is Thursday and we have the kids coming back to daycare on Monday? We have a lot to do in a few short days! (My hand is in the center to show I haven't broken a nail yet! I don't want to ruin my good nails with all of this sandpaper and paint!) 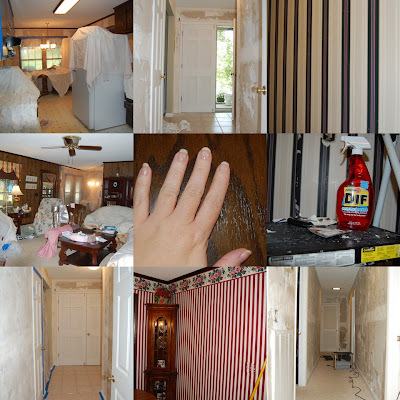 Notice the beautiful striped wallpaper we are removing. This wallpaper went up in 1994. So we are keeping a good 15 year average on re-decorating our house. The good news now is since the wallpaper is down if we want to change decor, all we have to do is paint! The kitchen wallpaper is a Waverly patterns that we thought was so pretty. Then in the last year I actually saw it on one of Oprah's 'ugliest kitchen's ever' show! She specifically had our wallpaper and said if you still have this pattern your kitchen needs a makeover! I admit the kitchen and hall...it's a lot of stripes going on! But not anymore! 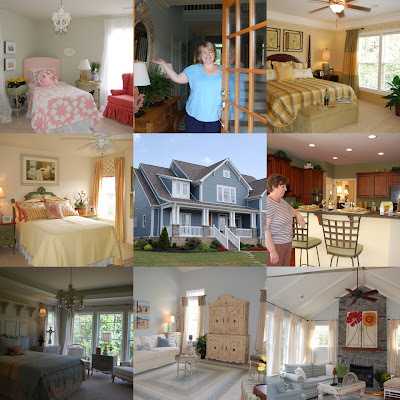 While we waited for the drywall compound to dry one afternoon we went to visit our 'dream home' for inspiration! It was such a cute little blue cottage in a new development. We enjoyed many pretty model homes and then came home to our mess! So depressing! Oh my goodness... I know this must be such hard work!!! I can't wait to see the final product. Good Luck. Oh man, I hate taking down wallpaper. I have found that vinegar water works best. Have you tried that?